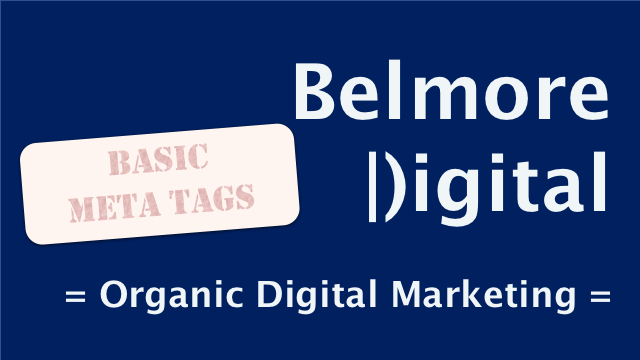 Basic SEO meta tags are sometimes thought of as all that is needed for good SEO rankings. Although, they have become less important over the years, they still set a strong foundation for a page’s SEO and can even control whether or not a page is indexed. This page will cover the basics of Title Tags, Meta Descriptions, Canonical URLs, Open Graph Tags and NOINDEX Tags. Title tags display on Google’s search results in (bold) blue. An accurate match of title to destination content starts the user journey off on the right foot. The title Google uses may not always be the same as the one on the page. Must use primary keyword or very close variant. Must use either secondary keyword, or keyword relating to content silo. Make sure critical content is within the first 60 characters. Aim to keep under 60 characters, however Google will index titles much longer than that, so do not slavishly follow this rule. Must use the brand or other names can be used if brand guidelines allow. Should use hyphens as separators, avoid pipes or other characters. Must avoid non-standard symbols or characters. Must be unique, including paginated URLs. Must accurately reflect the content of the destination page. Within the HTML code of the page, the <title> tag should be one of the first tags within the <head>. Brand can also be used in first or second position if looking to drive brand recognition. Gives the user a bit more description of what is on the destination page. Starts the user journey off on the right foot. The description Google uses may not always be the same as the one on the page. Keywords important to match user’s search, but description not relevant to search ranking. Can also be used for Open Graph Tags. Must use the primary keyword, or very close variant early on in the description. Should use secondary or silo keywords. Should include the brand (or variants of brand). Should be under 165 characters, but can be longer, especially if used for Open Graph Tags. Make sure want you really want to appear is in the first 165 characters. Must encourage the click-through to the destination page. Must use Call to Action (eg “find out more about…”, “see the…”, “learn about…”, “read about…”, “check out…” etc). Must accurately describe the contents of the page. Should reflect the opening sentences of the first paragraph of body text on the destination page. Should use readable sentence structures. Must not keyword stuff (~+3x repetition of same keyword). Most CMSs will auto-generate the relevant code for meta descriptions. Although some are spectacularly bad at it without additional plugins! (WordPress, I’m looking at you). Come and check out the great red widgets selection at ACME Manufacturing. We are known for our widget manufacturing, and always have great deals for our customers. This is a very long description which has no real purpose other than to fill space and take up valuable code space and space on Google's search results. It's supposed to be about some kind of widget or something to do with widgets, but never gets to the point and doesn't have any real purpose, like a call-to-action. We can save you money today! Helps search engines to de-duplicate their search results and indices, if multiple variants of a URL, or content exist. Helps to identify the original creator / publisher of content, if re-publishing others’ content. Viewed as a hint by search engines, not an instruction and should not be relied upon. For original content creation, Google and others usually prefer to go by the URL at they first discovered the content. There should only be one Canonical URL tag per page. https://www.domain.com/page.html – Canonical URL, can self-reference. http://www.domain.com/page.html – Canonical tag points to Canonical URL. https://domain.com/page.html – Canonical tag points to Canonical URL. Many CMSs will auto-generate Canonical URLs, if a page is available under different URLs, make sure it is working correctly and all URLs point back to the Canonical version. Canonical URLs should not be used in place of 301 Redirects. 301 Redirects are always preferred. Canonical URLs should not be used to disambiguate paginated content – use rel=prev and rel=next tags for that. Do not rely upon the Canonical URL to establish ownership / original creation of content. Google and others tend to place more weight on where they first discovered the content. These are not essential for SEO, but they are useful for influencing how your content is referenced when shared on Social Media. OG Tags give a structured way to reference and link to your content. If OG Tags are not present, Facebook and others will probably use other on-page signals to created the shared content. Each page should have its own Open Graph Tags. Many CMSs will create OG Tags for you, or have a plugin which can do it. Double check what actually gets published and be aware of what may or may not need to be modified. Twitter, Facebook, LinkedIn etc, all use different parts of this structured data in different ways. It is possible to craft individual tags for each site, but unless one social network is particularly important, usually it is more effective to find a solution which is “okay” with all of them. Use inside the <head> tags. <meta property="og:locale" content="%%Location & Language of Content%%" /> - eg "en_AU"
<meta property="og:type" content="%%Type of Content%%" /> - eg "article"
<meta property="og:site_name" content="%%Name of Site%%" /> - eg "Belmore Digital"
<meta property="article:publisher" content="%%Publisher of Content%%" /> - gives the Facebook URL of the publisher. <meta property="og:updated_time" content="%%Updated Time%%" /> - time last updated. <meta property="fb:app_id" content="%%FacebookAppID%%" /> - FB AppID, used for tracking FB stats. <meta property="og:image" content="%%Image URL%%" /> - URL of the image to use in the post. Google+ Open Graph Infomation – nb Google prefers schema.org markup, but will use OG Tags. These tags tell Google and other search engines not to index the content. They do not prevent Google from crawling the page. Do not use to prevent a URL from being publicly visible. Use only if you really do not want this particular content to surface in search engines, but still want any link equity accrued to the page to be passed to other content.